i pride myself on being a suave driver, and an intelligent one too,parallel parking aint nothing on me(round of applause here) i'm one of those who multi task while driving, i create playlist on my ipod or search for songs, eat , make calls, text chat, look sideways at the passenger seat to smile for the camera...or if i have a bright idea i quikly pick up my pen,put the notepad on the steering and i'm jotting and driving same time, and when my lil' angels are in the car with me, i'm constantly looking back to check out what they are up to, playing games with em and bending down to pick up stuff...and of course there is the occassisonal makeup sessions(NOTE: not makeout sessions, havent tried that yet). with me and most chics,i'm guessing the rear view mirror is more of a face view mirror, how many times have i reversed while staring in the mirror only to realise its my face staring back and not the rear...its a miracle i've never run into a lil' child or a curella's brand new jeep while staring at myself...now that would have been an eye opener. i hate to admit it but there have been a couple of DUI's,i prefer to drive myself home after a party(not like i party much)i'm more alert then and my friends trust me enough to deliver us home safely after our time out, but it doesnt matter how safe i can be, its wrong, i'm feeling its alright cos i can be safe, but what of the others who think its alright too and end up loosing their lifes and taking that of others with em' all because like me, maybe they felt they were safe. hope y'all try to limit your multitasking while driving...lets keep ourselves alive a lil' bit longer aight? I AM CHECKING FOR YA BOO! Check out my response to your response to my blog. cant drive and multitask?dont worry,its the year 2007!this is the future,baby!in another six months the flying car that drives itself comes out and we can ALL play our psp's to work.yaaay! I on the other hand have had 3 accidents. Al within my compound involving gates. it's a good thing there are no gates along the expressway. I've stopped playing rock while i drive . it brings out the beast in me. hi kimpossible, checked it out already. freakshow, six months you say? remember a joke i read, this lady was stopped by the police, shes like officer was i driving too fast..and he says, no, u were flying too low. so u predicton might just come through, while u fellas play ur psp, we'll get our groove on waxing our legs, doing sit ups and shaping our eyebrows. carl dear, if u were driving a hummer when the accidents occured then i'd give u kisses and hope gates are built on the highways. if rock brings out the beast in u what tames that beast? take it easy oh, we aren't ready to loose you just yet..
anyway how are u and what are the plans for the weekend? not sure about the weekend, havent made serious plans o...hope u have more fun than i will. OMG! I am so guilty of multi-tasking as I drive. I was actually riding with KC (she is like my lil sis...she is 18) and that girl has two cell phones. She was literally text messaging the entire time on both phones. Then at one point she got a call on one of the phones and was talking on speaker phone with that phone. And she had the Navigation system on speaker phone on her other phone. GO FIGURE! I am not sure how she did it. I was watching her and could obviously tell she was pretty skilled at this and that it was nothing to her. I was thinking to myself, "Did you just see yourself swerve in the other person's lane?" But, I didn't want to talk and add more to what she already had going on. All, I could say is LAWD protect us to myself. They are supposedly coming out with a law in 2008 that we all have to have head pieces now. I ALWAYS drive with my bluetooth in my ear. However, it is quite baffling when I walk in stores and people always ask "are you talking to me?" LOL! That should be your next blog Fantasy Queen: The 10 Most Irritating thing or does hearing someone talk on their cell in the grocery store, mall, etc irritate you. I was in the store the other day talking on my cell and a lady actually asked me to please get off the phone because I was annoying her. She SCREAMED it at me. Okay, enough of my rambling. Have a good weekend chica! Oh i bet i could think of a lot of things. I like. I am glad you are willing to change ur ways regarding driving. A lot of accidents happen just because of texting. I cant lie, i still speak on the phone when i am driving but i have stop texting. i dont even do it when i stop at a red light. kim, KC must be a super hero, doing all that and not rashing into anything. carlang the perv is been unleashed. allied, its a good thing u're able to stop texting while driving, was driving yesterday and it took a lot of self control not to pick my phone up when msgs kept coming in...i'm learning fast that safety precautions come first. you hate hummer, why now? loved the post, but reversed the roles in the cartoon. my dad always nags my mum about her driving each time she's in the driver's seat even after 30 years of driving. her mistake is that she let him teach her how to drive in the first place. 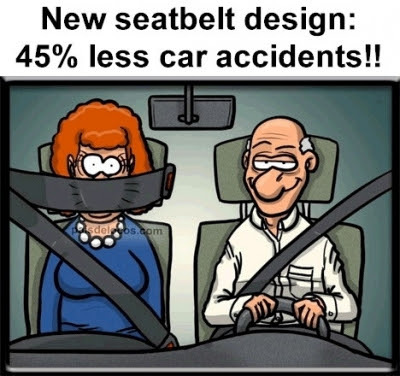 if they ever sell such seat belts, i'll buy her one as a betday present am sure she would be very grateful. azuri...when u see u life flash in ur face, u'd drop the most addictive thing like it's hot. This far gone, but it just happened yesterday after church. Driving and thinking wild almost got at me. Jedną wśród branży, które teraz mają bardzo istotną rolę na gospodarczym rynku jest księgowość. rozliczeń z instytucjami państwowymi, jako część krajowej gospodarki. rozpatrywać na kilka różnych typów. Dzisiaj biura księgowe nie muszą upominać się na niewielką ilośc klientów. o wszystko zatroszczyć się osobiście. Mając to na uwadze korzystają oni z usług oferowanych na rynku, jakie okazują się doskonałym wyjściem. która ma czuwać na zgodnością finansów w firmie.